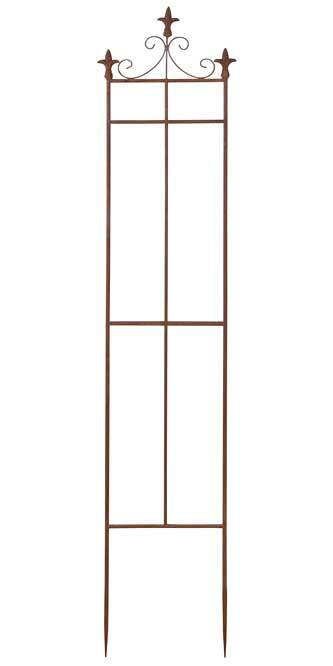 Add a bit of old world style to your landscaping or sunroom with the Esschert Design Rust Narrow Fleur-De-Lis Trellis. The ornate top and classic shape of this trellis bring a wonderful hint to your home or garden, and the unit handily provides support to a climbing plant. Round, steel rods form the rectangular frame, while a matching, vertical rod in the center offers both style and support. A fleur-de-lis finial tops this center rod and each side rod, bringing the French motif to the forefront. Two scroll shapes flank the center finial, elevating it for a fantastic focal point. Steel slats intersect these round rods, creating the internal grid and bolstering the geometric outline. Two, 12.25" long legs each have pointed ends to insert easily into soil, and the 11" width of the piece allows you to place it in a large pot for a different look. The rusted finish of this trellis creates an aged look, furthering the classic theme, and the all steel construction remains durable for many seasons. Provide a touch of French style to your climbing plant with this Rust Narrow Fleur-De-Lis Trellis.